Place : Merritt island, Florida. Description : Canaveral Cape is an American launching base located in Florida that was created in 1959. It is a military zone. 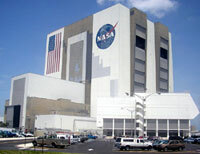 Its administrative name is John F. Kennedy Space Center. This base has the highest travelling tower in the world (377 feet - 115 m). Place : New York, New Jersey. Description : The SR-71 Blackbird was conceived like the successor of Lockheed U-2: an observation aircraft usable to the top of "hostile theatres of operations". The structure of BlackBird is out of Titanium, whose fusion takes place with 1660 °C, which enables him to reach higher speeds. Place : Andrews Airforce Base, Morningside, Virginia. Description : Created in 1957, JetStar transported presidents Nixon, Johnson, Ford and Carter during their displacements. JetStar is the first presidential plane in the United States, called " Air Force One " nowadays. Place : Between Monument and Colorado Spring, Colorado. Description : First B-52 Bomber flight was in 1952 with the US Air Force. B-52 objective was to carry the American nuclear weapons. It is one of the symbol of the cold war and was in 1952 one of the largest planes in the world. It was used in the Vietnam and Iraq war. Of a scale of 185 feet (56.39 m) it can reach 593 mph (955 km/h) and can traverse 7450 miles (12000 km) of a feature. Description : This place is a cemetery of planes. There are 2000 planes stored in full desert because of the American disarmament program. These 2000 planes represent half of all the American military fleet and will be able, in the event of war, all to be given in service in only six months. You will notice can be that certain their wings broken and brought back along the fuselage have, it is to show to the Russians via the images made by their satellites that American respects their engagement in term of rate/rhythm of disarmament. Description : A water bomber helicopter is a helicopter conceived to fight against the small forest fires and the major fires. The helicopter of this view transports a head of water at the end of a sling (cable hung under the helicopter), one speaks about "bucket" or "bambi bucket". Place : Mayport Basin, Jaksonville, Florida. Description : The aircraft-carrier "John Fitzerald Kennedy" belongs to the U.S. Navy. Appeared in 1964, this nonnuclear aircraft-carrier is always active in 2006. Place : Mugu lagoon, Oxnard, California. Description : Grumman E-2 Hawkeye is a monitoring plane for any weather any transportable by aircraft carrier that was developed by the American manufacturer Grumman. E-2 Hawkeye is in working since 1964 and its crew is composed of five men. Apart from the American navy, it is also used by the French Naval Aviation and the Air Forces of Taiwan, Mexico, Israel, Singapore, Japan and Egypt. Description : Arsenal is the first naval port of France. It is the fastener point of the Charles de Gaulles aircraft carrier that we see on this sight. This door plane is the only one still in activity in France, the "Charles of Gaulle" is propelled by nuclear energy. This aircraft carrier is 858 feet (261,5 m) long , 211 feet (64,36 m) broad, and 246 feet (75 m) high for a 40600 tons weight. Description : The Maemi hurricane in South Korea was the most powerful of these 100 last years in this area. Winds of 135 mph (216 km/h) reverse this cruising boat in the Busan port. Description : Blackbird Airpark (AFFTC Museum) is an open museum since 1991. This museum at summer set up in order to preserve the memory of Black Bird, able to reach the speed of 2194 mph (3532 km/h). Description : It is in Cervio that was held the STACK EuroCup 2005, European championship of lifting kite. Description : Lone ship lift transverse type system in Europe, the tilted plan of Saint-Louis-Arzviller replaces seventeen locks. This wonder of technology completed in 1969 is composed of a 141 feet (43 m) long single box, fixed on two 450 tons counterweights and moving on a concrete slope. This boat lift makes a record time to cross the boats of 147 feet (45 m) disalignment (out of 2.5 miles - 4 kilometers) in 4 minutes. This spectacular work, located on the Marne channel at the Rhine, is one of the most visited sites in this region. Description : Small car accident with a vehicle in combustion. We can observe a 1.25 mile (2 km) stopper. Description : Here is a MIG-21 stationed in a supermarket not far from Elsey in Germany. Description : 7 persons per team play instead of 11. We don't see the balloon in spite of the quality of this satellite view. Description : This miniature city is a reproduction (1:25) of a Dutch city. All the component of a city are represented there: the airport, channel, train. Place : Between Ohio Key and Pigeon Key, Florida. Description : The famous scene of car the track car and the helicopter of the True Lies movie was filmed on this bridge (Overseas Avenue). Description : Here is the weather center in France, in Toulouse (31). Adresse : 42 avenue Gaspard Coriolis 31100 toulouse. Place : Hermit Hill, South Australia. Description : 2.2 mile (1.5 km) length draw representing a man. Place : Las Vegas, Nevada. Description : The Luxor hotel pyamid was inaugurated in 1993, it measures 360 feet (110 m) height! It comprises 4400 luxury rooms, 6 restaurants, an Olympic swimming pool, a movie theater, etc . Description : The Kremlin of Moscow is the political center of Russia and the geographical center of Moscow. The Kremlin is a true urban fortress in a triangular form. Place : Thousand Islands, Everglades, Florida. Description : This island located near to the Florida coast seems to be repaired, you will observe the seams still present. They form the largest mangroves estuary in the world. Description : This plane is situated not far from the WTC ground 0, on a building. The landing seems rather complicated. Place : Hedjaz desert, La mecque. Description : The Mecque city is a crowned city of Islam, located at the west of Saudi Arabia. The Mecque place is a place which any practising Moslem must visit at least once in his life. Ka' Ba in its center is visited every year by 2,5 million believing. Description : The White House is the official residence and the principal place of work of the United States President. Built in 1790, it counts 132 rooms. 5000 people visit every day"by far" the white house. Note : the white house roof was censured. Description : Certified copy of the Eiffel Tower in France. It measures 540 feet (165 m) and is located in front of the hotel-casino Paris Las Vegas. Description : Here the only solution to be quiet in the country the more populated in the world (1 300.000.000 people). Place : Rue du Mont Thabor, Paris (75). Description : Notice this national police car across the road. A police officer seems posted on the left side of his car. Place : San José, valley of the Large River. Description : Discovered in 1930, the Nazca lines are composed of approximately 300 giant size drawings . According to the specialist in géoglyphes Maria Reiche, these symbols were drawn by the people to communicate with their gods of their hunting activity . Other theory go in the direction of the UFO phenomenon. Intended to be seen by sky, this bird has more than 2000 years. Its conservation is due to the geological structure of these plains. More Nazca lines here ! Description : The Toronto town seems to return little by little in the Matrix. To see : the scene place of the highway in the Matrix movie. Description : Giant Pacman drawn by a farmer in his field. Description : Drawn on the ground, this 395 feet (120 m) length shadok proves to us that they succeeded in well in reaching the Earth: their main goal! Like says it the Shadok saying: "If there is no solution, there is no problem". "The umbrella for dry time". Description : In the carpark of a school, this jet seems to have problems of parking in this miniature airport. Description : Vatnajökull is the largest glacier of Iceland. It is in the south-east of Iceland. With its approximately surface of 8 100 km ², 8% of the surface of Iceland disappear under its cap. The ice has a maximum thickness of 3280 feet (1 000 m). This glacier was formed 2500 years ago. Description : One of the cradle of French aviation. The Center of the Flight tests (CEV) built in 1938, is one of most important in the world. Description : The European agency for air control (EUROPCONTROL) mask this plane which is ready to takeoff on the 4 km length track (2nd the largest in France) located in lower part. This track is in addition easily flooded "when it is necessary". Description : The Death Valley National park (or Death Valley) is located at the east of the Sierra Nevada in California. It is an arid park and it contains the greatest desert relief of the United States continental part. The bottom of the valley of Death is with more than 300 feet (90 m) under the sea level. Since the death valley formation, the area underwent at least four periods of volcanicity. Description : Created by a group of Vienna artists, this pink rabbit measures 215 feet (60 m) length. This work should still remain until 2025 on this mountain. Description : This labyrinth has the characteristic to be entirely made up of pineapple plantation. Located in the exploitation "Dole". Description : Santa Pod is a high place of dragsters races in Europe since 1966. There is 50 events per year there. Description : The aquiculture is the culture of fish, molluscs and fresh or watery salted water plants. The aquiculture is during watery of agriculture. We raises a livestock of marine animals there in order to market them. Description : The Plovdiv theatre , built during the Roman period, seem to have forgotten its true place. [16/06/2006] - Thanks to the Golshane association for the translation. Place : Province de Kaboul. Description : Translation of this text : "Police force ". Sight seeing of Paris in France.